Preserved in astounding condition, this interesting Flying Officer wristwatch was produced by Gallet, but retailed by Jacquet Droz. 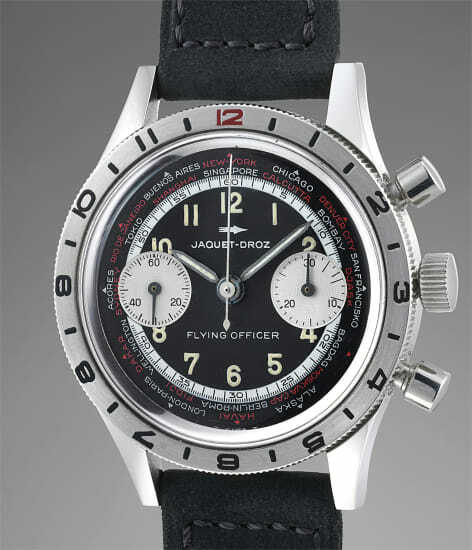 Rumored to have been developed under Harry Truman, the Flying Officer is an incredibly useful tool watch. While the chronograph function enables the wearer to measure time intervals, the rotating bezel and worldtime scale also allows the user to track multiple time zones. To the best of our knowledge, the present watch is the only Gallet "Flying Officer" wristwatch retailed by Jacquet Droz that has appeared on the auction market, making this timepiece incredibly rare. Furthermore, it is offered in unpolished and most probably "New Old Stock" condition with crisp facet, full lugs. All the original printing on the dial remains intact. The luminous material has aged evenly with the hands and now display beautiful patina.